Frozen Yogurt at home is really simple with a tub of Fage and an ice cream maker on hand. 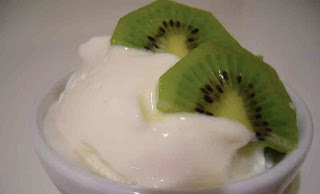 I dump a full container of Fage into a mixing bowl with a 1/2 cup of sugar and blend well so all of the sugar dissolves. Add the sugar and yogurt mixture to the ice cream maker and freeze according to instructions. Most ice cream makers can handle a doubling of this recipe if you want to make a larger amount, which might not be a bad idea. The tartness and sweetness of this frozen yogurt is irresistible. Enjoy! mmmm...like Pinkberry at home. I love this stuff. Nice recipe! Simple and easy. If you want to learn more about Ice Cream Makers, check out my blog post.